Tenet Healthcare Corp. management has for the past couple of years been in a delicate dance for control of the company—carefully acquiescing to its biggest investor's spins and steps. That investor, Glenview Capital Management, has been at times a passive shareholder, a friendly owner with designated board members and now an essentially hostile, activist owner. Investors are getting more active in pursuing changes at healthcare companies. The hostility surfaced to the public after the country's third-largest investor-owned hospital chain tweaked its bylaws to let shareholders meet outside of the company's annual gatherings, potentially making it easier to vote on important changes and topping off a long string of tense back-and-forths between the health system and Glenview Capital. The seemingly shareholder-friendly move, however, was not well received by Glenview, which is now actively seeking an easier path for shareholders to unseat board members. Its CEO is calling for a proxy vote to let shareholders act by written consent without holding meetings, which he said is less onerous than physical meetings. Tenet is not the only publicly traded hospital company being targeted by aggressive shareholders, who increasingly are demanding more of a say in governance and operations. "Shareholder activists aren't always right, but they're not always wrong," said Richard Brand, a partner with the New York law firm Cadwalader, Wickersham & Taft who often helps companies defend against activist investors. "It's important for a board of directors of a company that's been targeted by an activist to listen to the activist's ideas with an open mind and in good faith." The vast amount of activist shareholder spending is still centered on industries like energy, technology and consumer goods. And the money wrapped up in those campaigns more than doubled between 2016 and 2017, when campaign spending hit $62 billion, according to a report by Lazard, a Bermuda-based financial firm. But in recent years, activists have ramped up their attention on investor-owned health systems, although these providers still make up a tiny sliver of overall spending. In 2017, 7% of campaign spending went toward healthcare, compared with 5% between 2014 and 2016. And the vast majority of activist spending in healthcare is still directed at pharmaceuticals and medical specialties. 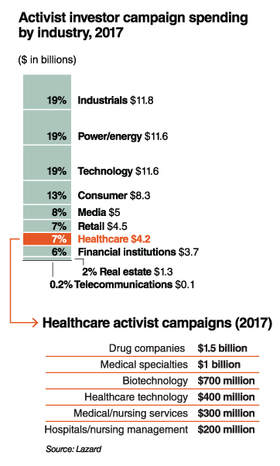 Of the $4.2 billion activists spent last year, only about $200 million went to a category that includes hospitals, according to Lazard. But for the hospital companies being targeted, it's no small matter. An emerging trend intensified at the beginning of 2017 when historically passive investors started to take activist stances, said Kern McPherson, senior director of North American research for San Francisco-based Glass Lewis, a major proxy consulting firm that provides research and voting advice on more than 7,000 companies for more than 1,200 investors worldwide. McPherson characterized the shift as long-term investors taking a greater interest in being stewards of their investments. A prime example is investors putting heat on pharmaceutical companies that make opioids. Indeed, the numbers show first-time activism is spreading. About 53% of activists that launched campaigns across all industries in 2014 were first-timers, compared with nearly 60% in 2016, according to a report by the Chicago-based financial data firm FactSet Research Systems. Activist shareholders tend to target companies whose performance is lagging to the extent that investors start to fear their return on investment is threatened, putting struggling companies like Tenet and Community Health Systems on activist shareholders' radar. "If their business starts suffering, that's when you really start to fall into the crosshairs of investors," McPherson said, "and they will start scrutinizing your corporate governance and your pay more heavily than they did before." Hospitals for years have faced pressure stemming from things like slowing admissions growth, rising expenses and, in some cases, heavy debt loads. The Affordable Care Act provided a temporary reprieve in uncompensated-care costs, but there's some indication that benefit is wearing off. The ACA's initial effects on hospitals were more pronounced than industry analysts had expected, said Michael Waterhouse, healthcare analyst for the investment research firm Morningstar. Even though that bump is winding down, hospitals still benefit from the silver lining of relatively low inflation, he said. Some prominent investors dominate the lists of top shareholders in the country's five largest publicly traded hospital chains. BlackRock, the world's largest asset manager, has slowly bought its way into each company's inner circle, with ownership stakes ranging from 6.2% to 13.6%. Long known as a passive investor, BlackRock, a powerful company that manages $1.7 trillion in active funds, has signaled that an activist transformation may be developing. In a letter last month to company CEOs, BlackRock CEO Larry Fink highlighted pressing issues like wealth inequality, rising automation and climate change and wrote that companies must increasingly respond to societal challenges. Fink challenged executives to explain how they'll use their lower income taxes under the new tax law to create long-term value. More broadly, he said companies should come clean about how other legislative and regulatory changes affect both their near-term balance sheets and long-term growth strategies. "Where activists do offer valuable ideas—which is more often than some detractors suggest—we encourage companies to begin discussions early, to engage with shareholders like BlackRock, and to bring other critical stakeholders to the table," Fink wrote. "But when a company waits until a proxy proposal to engage or fails to express its long-term strategy in a compelling manner, we believe the opportunity for meaningful dialogue has often already been missed." 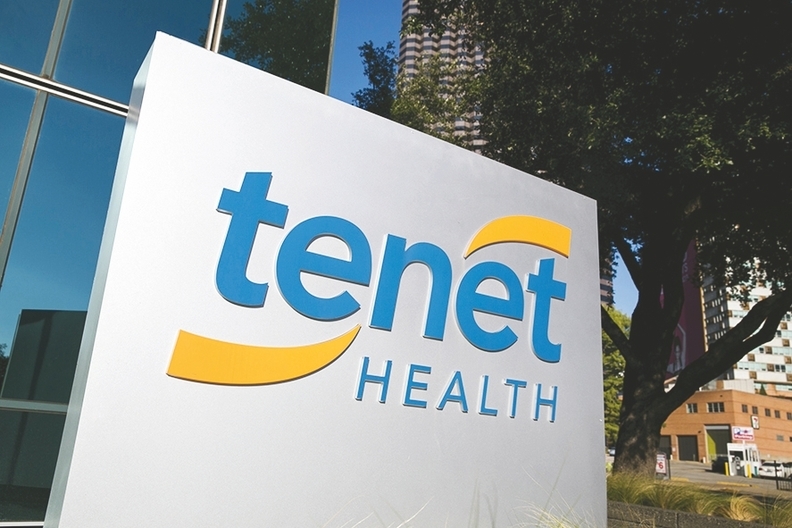 Camber Capital Management owns a 5.7% stake in Tenet and formerly owned a 5.5% stake in CHS before selling its position in 2016. The activist hedge fund in 2016 pushed for changes at patient-management information company Sequenom before it was sold. John Morrow, managing director of the healthcare data and analytics firm Franklin Trust Ratings, said shareholders tend to get frustrated with health systems when their quarterly earnings calls seem to oversimplify important issues, such as missing their own guidance on key metrics. Investors begin to question whether they're getting the whole story. "It's one thing if you miss the Street's guidance, but if you miss your own, there's got to be frustration there," he said. "So you read these things and you say, 'Gee, what's going on?'" All things considered, healthcare is no different from other industries in that shareholders are simply looking for a return on their investments, Morrow said. The difference here, though, is that's becoming an increasingly tricky proposition. "People don't see certainty," he said, "and when people don't see certainty, they become skittish." With no indication the stress on hospitals will let up anytime soon, experts say investor-owned health systems should expect to see shareholder activism ramp up even more. "When you have an industry where a number of the participants have struggled and are laggards to their peers, that's the type of industry that is more likely to attract activist investors because of the opportunity to catalyze a turnaround," Cadwalader Wickersham's Brand said. The best way to prevent negative scrutiny—or to at least shield from its most damaging effects—is to get out in front of it, Glass Lewis' McPherson said. When a health system's leaders see challenges on the horizon, McPherson recommends they let shareholders know sooner rather than later, and share the system's plan for weathering the storm.